Here in Texas it’s a steamy one hundred degrees this hot summer day. So, what do you want most on hot days? Homemade Blueberries and Cream Popsicles! Kids love food on a stick and ice cream is no exception. My kids love it. But, let’s face it, most store-bought frozen treats are laden with excess sugar and too many chemicals. Not these Blueberries and Cream Popsicles! She loves her ice cream! I love these pop molds too because they have a little tray to catch all the drips. No mess. Love that idea! Well, almost no mess. 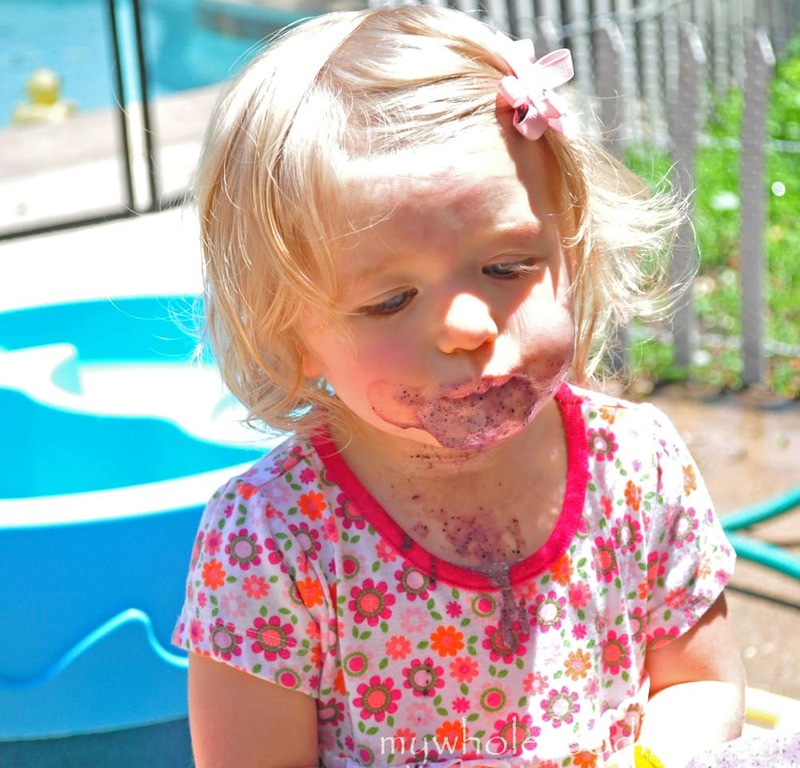 She may be messy, but she is so darn cute! I wanted make this popsicle recipe ever since I saw some Pina Colada Popsicles on The Midnight Baker’s blog. They looked AMAZING! I just ran out of pineapple, so I subbed blueberries. Came out super good, but I am trying her recipe as soon as I get my hands on some pineapple! Creamy coconut milk and fresh blueberries is always a winning combination! Pour all ingredients into a blender and blend for about 90 seconds. Take a taste, if it’s sweet enough, pour into popsicle molds or smoothie pop molds . If not, feel free to add more maple syrup and blend for a few more seconds.I think I used 2 tablespoons maple syrup total in mine. If you don’t have pop molds, you can even make it ice cream, using an ice cream machine . All these options are great. I hope you and your family enjoy them as much as we did. 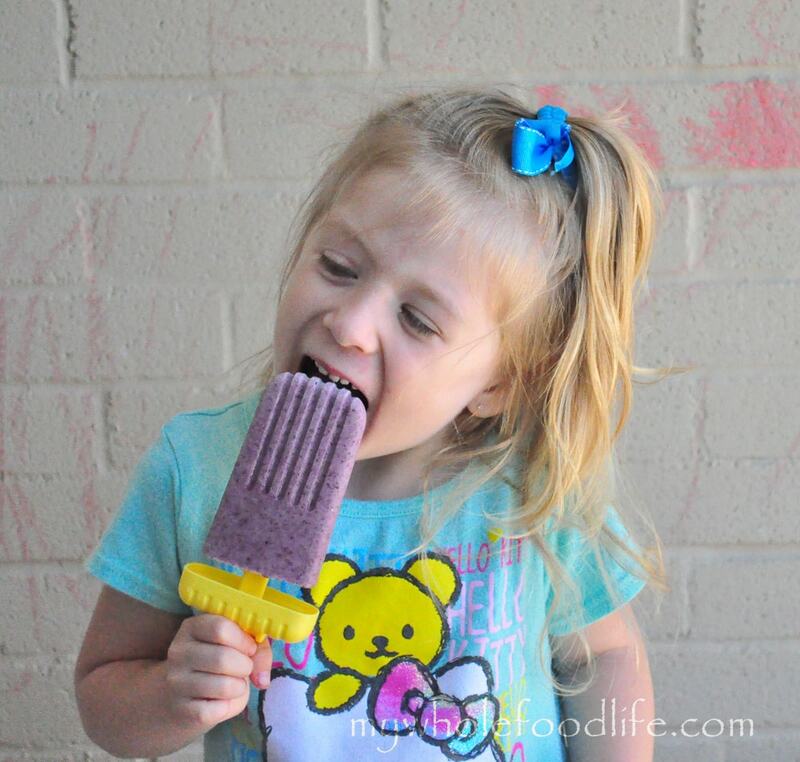 There will be more popsicle recipes coming this summer too! 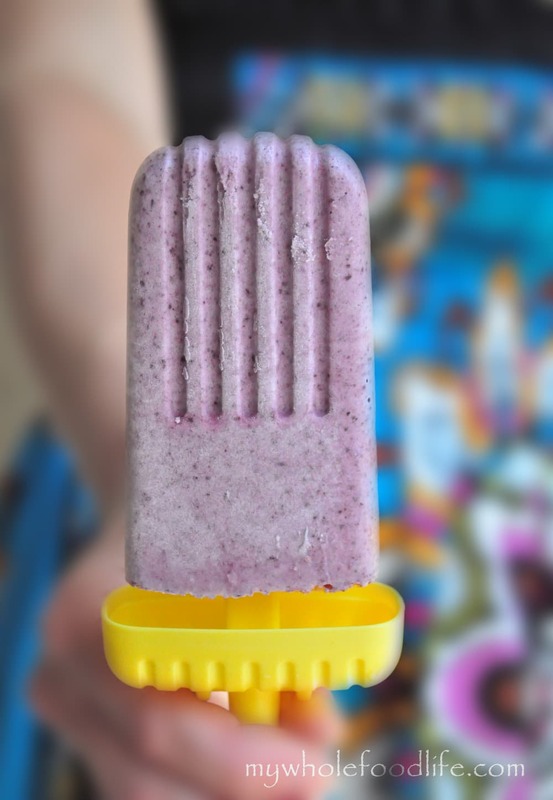 I just finished making your blueberry cream popsicles and they were sooo good. I've always avoided coconut because I've been told it's high in cholesterol and will raise my already high numbers, but the can said zero! I'm so excited that the myth is wrong because I love love coconut! Thanks for the wonderful recipe! P.S. Love the picture of your daughter! Thank you Lisa! Glad you enjoyed them! I tried these with my kids. I don't know if I used the wrong kind of coconut milk, or if fresh vs. frozen blueberries make the difference, but they didn't taste a whole lot like blueberries and they had a grainy texture. I used fresh blueberries, syrup, and unsweetened full fat coconut milk. It was in a carton, not a can, so I had to guess at the amount. Any suggestions? Can we use fresh cream (dairy) instead of coconut?We are sensitive to gums,and unfortunately the cans do have it.Also,the ones from the cartons are full of other "bad" stuff.Thank you.